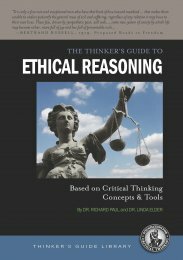 This guide provides insights into the nature of ethical reasoning, why it is so often flawed, and how to avoid those flaws. It lays out: the function of ethics, its main impediments, the social counterfeits of ethics, the elements of ethical reasoning, important ethical abilities and traits, the vocabulary of ethics, and the intellectual standards essential to the assessment of ethical reasoning. The proper role of ethical reasoning is to highlight acts of two kinds: those which enhance the well-being of others—that warrant our praise—and those that harm or diminish the well-being of others—and thus warrant our criticism. Developing one’s ethical reasoning abilities is crucial because there is in human nature a strong tendency toward egotism, prejudice, self-justification, and self-deception. These tendencies are exacerbated by pow­erful sociocentric cultural influences that shape our lives—not least of which is the mass media. These tendencies can be actively combated only through the systematic cultivation of fair-mindedness, honesty, integrity, self-knowledge, and deep concern for the welfare of others. We can never eliminate our egocentric tendencies absolutely and finally. But we can actively combat them as we learn to develop as ethical persons. The ultimate basis for ethics is clear: Human behavior has consequences for the welfare of others. We are capable of acting toward others in such a way as to increase or decrease the quality of their lives. We are capable of helping or harming. What is more, we are theoretically capable of understanding when we are doing the one and when the other. This is so because we have the capacity to put ourselves imaginatively in the place of others and recognize how we would be affected if someone were to act toward us as we are acting toward others. This mini-guide will not automatically make anyone an ethical person. But it does provide an essential foundation, without which ethical discussion will often end in hopeless disputation or discouraging contradiction and misunderstanding. Developing as an insightful ethical reasoner and person takes time and much practice.